Hype is true, a must buy for anybody! All the hype is true! It's a great family (or adult) game. I play with my wife and my 6 and 8 year olds. We found the instructions can be a tad bit confusing at first, so my suggestion is to just start playing and after a few turns you will get the hang of it. As with all games, my advise is to not worry if you make a mistake on your first game. It is very exciting and definitely gets your adrenaline going once the island starts to sink! If I had to complain about something, I wish it wasn't in a tin. Boxes look and stack so much better on the shelf. Just my 2 cents. This is a light strategy game that is all cooperative. It is suitable for even young kids. The components are nice and it is a good game for the price. Replay-ability over a long time is poor. 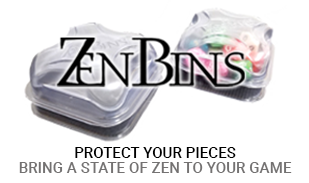 It is similar to pandemic but with lighter strategy and less terrifying. Its a great game if you have friends! This is one of the games you could play by yourself but you shouldn't. Me and my little brother were about to win and our greed of getting the treasure first made us die. 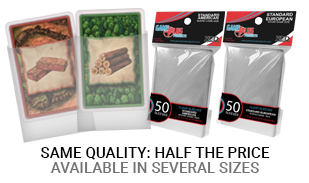 It's cheap, its fun, and it's well crafted in both rules and physical product. The game comes in a metal cookie tin. Inside is everything you'll need to play. Players each control a single team member attempting to rescue treasure from a sinking island. Each player has a special ability depending on their job role. Players must often combine their special abilities to be efficient enough to beat the game. Additionally, the game "board" is randomly created by various different location tiles. This means that every game is going to be different as players will take on different combinations of job duties, as well as play on a unique map. This game is a no brainer for anyone who likes cooperative game play at an extremely reasonable price. I can't say enough about this game. First, its only $13.50, second, its one of the best co ops I have played since Pandemic. The rules are easy to pick up and jump into a game. This is not an easy game to beat and is easy to ramp up the difficulty when you master it. Fun conversations around the table will be had while trying to escape the island with the artifacts. 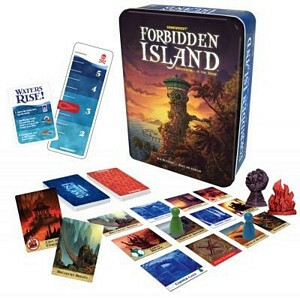 Forbidden Island is another solid Co-Op game that makes frequent rounds around our group. The rules are simple, the consequences clear, and the amount of replay ability through map generation is fantastic. The only real downside comes when you get someone around the table who ends up taking a 'Leadership' role and telling people what to do. In this game especially with such a small amount of choice and very little wiggle room for error, it can make the game drag for the other players. Very rarely will this be a back to back playable game like others, but is still a great game we come back to now and again. It doesn't take hours and hours to play, and for the price you get a pretty good game. The rules were simple enough that my friends and I spent a few minutes reading about it, then jumped in and enjoyed it. The only tricky thing is remembering to use the sand bags but that just comes with practice. We will definitely be playing this again. Fun co-op game for the family. The 4 treasure pieces are nice quailty along with the game tiles. It can be very tough to beat with only 2 players, but makes it fun to start a new game one after another.